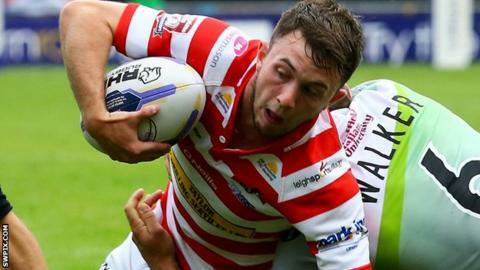 Ryan Brierley's hat-trick helped Leigh Centurions defeat Championship rivals Featherstone Rovers to progress to the Challenge Cup quarter-finals. The Leigh scrum-half's treble and goal, added to scores from Liam Kay and Kurt Haggertry, were enough to see off Rovers five tries to four. Stand-off Martin Ridyard kicked two goals for the second-tier leaders. Featherstone scored four tries, two apiece for Will Sharp and James Mendieka, but missed all four kicks. Leigh: McNally; Higson, Pitman, Armstrong, Kay; Ridyard, Brierley; Wilkes, Penkywicz, R Duffy, Sarsfield, Goulden, Barlow. Replacements: Beswick, Hopkins, Haggerty, Spencer. Featherstone: Hardman; Uaisele, Worthington, Mendeika, Sharp; Kain, Moore; James, Ellis, Hirst, Cording, Spears, Lockwood. Replacements: Flanagan, Dale, Bostock, Briggs.